I’m often afraid for new films in such successful franchises to reboot because they so often let us down. After an initial hit with “Jurassic Park” in 1993 and then “The Lost World: Jurassic Park” in 1997, 2001’s “Jurassic Park III” could have put the trilogy to bed. In 2015, though, it turns out that executive producer Steven Spielberg had something more to say and much more to show with a reimagining that fully takes advantage of the colossal 3D IMAX format. I’m usually not a critic to recommend 3D and certainly only potentially widely adopted films are shot and released in IMAX, but you shouldn’t spend theatrical money on “Jurassic World” at all unless you see it in 3D IMAX. And you most certainly should see it as it’s a follow-up film that’s much more than just a bigger, louder and faster popcorn flick. Paying homage to what makes these films so lovable to so many people, “Jurassic World” starts where it needs to: with a cute new kid (Ty Simpkins) who’s filled with passion and wonder for dinosaurs. Even as he’s grappling with the uncertainties and sadness of his parents’ impending divorce, trekking to Isla Nublar (the location of the first “Jurassic Park” film) gives him and his brother (Nick Robinson) hope and positive distraction. 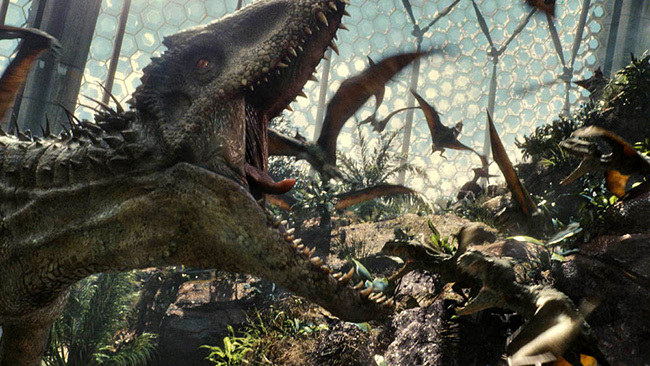 Read Adam Fendelman’s full review of “Jurassic World”. Once there, though, things of course go awry. Rather than breeding dinosaurs, now the island is unfortunately but understandably and believably futuristic – running as a business and needing to turn profits for its shareholders. For kiddies, it’s yet another “PG-13” film, but as a warning, it’s easily the most violent and realistic in the series. Follow-up films always have to up the ante and “Jurassic World” does it with its realistic action violence. We’ve got the stone-cold businesswoman, Claire (Bryce Dallas Howard), running the island like a business without falling in love with the animals. And then we have the “velociraptor whisperer” Owen (Chris Pratt) who sees them for what they really are and earns their trust by building a relationship. While their characters are critical to the mission at hand, together their flirtations with each other don’t pay off in a convincingly chemical way. The film shouldn’t have tried to go there. “Jurassic World” stars Chris Pratt, Bryce Dallas Howard, Judy Greer, Omar Sy, Ty Simpkins, Irrfan Khan, Vincent D’Onofrio, Nick Robinson and Jake Johnson from director Colin 124 minutes, is rated “PG-13” for intense sequences of science-fiction violence and peril. It opened on June 12, 2015. Continue for Adam Fendelman’s full review of “Jurassic World”. The Indominus rex dominates all creatures in her path in “Jurassic World”.